Home > Internet Celebrities > Who is WOWHobbs? Most of us adults will probably not have heard of this new celebrity. Not from television radio or stage, but from the world of Internet games.Type in “WOWHobbs” in Google and you will see hundreds of pages baring his alias. 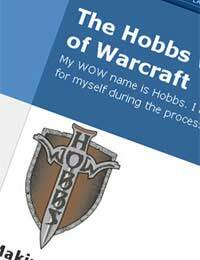 If you play games on the net, you have probably heard of WOWHobbs.Hobbs is actually his user name on the game currently taking the Internet by storm, “World of Warcraft”. The game seems to be highly complex to even the most technical of people. It seems that our kids love the game with all its idiosyncrasies. These days, it seems to be the most popular of all the games currently out there on the World Wide Web. Hobbs is a WOW Consultant! Hobbs seems to be the WOW consultant who demonstrates, via video and audio all the things you can do in the game. If you have not played games on the web before and are new to World of Warcraft, you could learn a lot from this guy. He seems to be extremely dedicated and knowledgeable. However, even the most technical IT consultant would have difficulty understanding what is meant by “raids”, “guilds”, “PVE”, “kodo” and hundreds more. A whole new language has arisen from the game. In order to understand the language you have to play the game and learn the ropes. Some degree courses are probably not as complex. The game is now worldwide. It can be purchased in stores and seems to run best on Windows XP, although it can run on Vista. Once installed, the game can be upgraded to the latest version. Patches and new environments are continually being released. Hobbs is very dedicated. You can subscribe to his blog if you wish to learn more. The information provided seems to be mainly targeted to experienced players. For a beginner it is probably best to install the game and read the original instructions in order to obtain the basics. Hobbs has clearly become a celebrity among young people who play the game. Internet games are popular among young people as you would expect. He also releases videos frequently on You Tube, the figures on these indicate that hundreds of thousands of views on his videos take place on a daily basis. Comments like “you are the best pally puller I know” and “hey man u r like the best but what's ur gear?” are commonplace on the responses to these videos. What Can we Learn from Hobbs? Hobbs has mastered the power of marketing his ideas on the World Wide Web. Games just happen to be his specialism, and now he is famed for it. We could all learn something about marketing from his enthusiasm and dedication. It has made him a famous Internet celebrity. WOW players love him! He now has over 67,000 subscribers on You Tube and 1,285,216 channel views. Almost 18,000 of his videos have been watched. His blog probably has substantially more entries. He is basically the main resource for players of WOW.